Janzen's Pharmacy is the only company in North America with dual packaging SynMed technology – a safe and sterile way to package your medications and help you follow your prescribed medicine regime. SynMed creates multi-dose and colour-coded blister cards that contain your personal medication dosages, organized by time of day. A simple scan of the barcode on the cards makes refills accurate and easy. 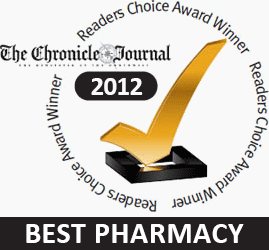 Janzen’s goal is to make taking multiple medications simpler and safer for you. With SynMed, we can.